The accordion is a portable, freely vibrating reed instrument. It consists of a keyboard and bass casing that are connected by a collapsible bellows. Within the instrument are metal reeds, which create sound when air, generated by the movement of the bellows, flows around them and causes them to vibrate. The accordion is constructed from hundreds of pieces, and much of it is hand assembled. First constructed in the early nineteenth century, the accordion continues to evolve into an ever more versatile instrument. Development of the accordion is generally thought to have been inspired by the Chinese cheng, the first known instrument to use a free vibrating reed to create sound. This instrument was invented approximately 5,000 years ago. It consists of a series of bamboo pipes, a resonator box, a wind chamber, and a mouthpiece. It has a shape that resembles a phoenix and was introduced to European musicians in 1777. The first accordions were invented in the early nineteenth century. In Germany, Christian Buschmann introduced and patented an instrument called the "Handaeoline" in 1822. It had an expandable bellows, a portable keyboard, and a series of free vibrating reeds inside. Seven years later, Cyrillus Damian refined the instrument by adding four bass keys that produced chords. He was awarded a patent for this instrument, which he called an accordion. Over the next several decades, various improvements were made to the accordion. One major modification was made in 1850, when the chromatic accordion was introduced. The early diatonic accordions produced different notes when the bellows were drawn opened and pressed closed. The chromatic versions produce the same note regardless of the action of the bellows. Steel reeds were incorporated into the instrument in 1857. As several early companies, such as Hohner, Soprani, and Dallape, began manufacturing the instrument in the 1860s, other changes were made. The addition of more bass keys was particularly important. By the early twentieth century, manufacturers had settled on a standard size and shape for the instruments, which eventually led to the modern accordion. The incorporation of electronics into accordions began around World War II. At first, they were wired to allow a hookup through an electronic organ. Eventually, accordions were connected to electronic boxes of their own, allowing for sound generation, amplification, and speakers. A recent development is the inclusion of Musical Instrument Digital Interface (MIDI) systems with conventional accordions. Instruments which have MIDI contacts can be connected to any MIDI-compatible device, such as synthesizers, electronic pianos, and sound modules. The modern accordion has three primary sections, the expandable bellows and the two wooden end units called the treble and bass ends. The treble end of the accordion has a keyboard attached. The bass end contains finger buttons that play bass notes and chords. The reeds and electronic components are located on the inside of the bellows. The accordion is called a free reed instrument because it uses free-standing reeds to produce sound, similar to the harmonica. The reeds are made up of metal strips that are riveted to either side of a rectangular metal plate. Below the reed is a slot which allows air to flow through the bellows. When air passes through this slot in the appropriate direction (first on the reed, then through the slot) the reed vibrates, producing the characteristic accordion sound. Air flowing in the opposite direction does not create sound because the reed only bends instead of vibrating. To conserve air, a plastic or leather flap is placed on the opposite side of the slot away from the reed, preventing air flow in this direction. Each reed is arranged on the treble or bass reed blocks and is associated with a key on the keyboard or various buttons on the bass keyboard. The length and thickness of the reed determines the pitch of the note it produces. For example, a long reed produces a lower note than a shorter reed. Depending on the type of accordion, there can be multiple treble and bass reed blocks. The keyboard on the treble side of the accordion can have various configurations. A popular style is the piano-type keyboard. Each key is extended into the body of the accordion and has a device attached to it called a pallet, which covers the holes of the reed block. When the key is left undisturbed, the hole in the reed block is closed and air can not reach the reed below. Depressing the key causes the pallet to open, allowing air to flow to the reed and producing sound. The treble grill covers the action of the keys on the pallet. Another set of keys on this side of the accordion are the register keys. These keys operate slides that can bring in different sets of reeds, thus increasing the variation in tonal quality available. Like the treble end, the bass end is also attached to the bellows by a wooden plate. It also has a keyboard and register buttons. The bass keyboard is much different than the treble keyboard, though. Instead of traditional piano-style keys, it is made up of buttons. These buttons are attached to a series of rods and levers that control the airflow through the bass end reed block. When a button is pushed, multiple notes, or chords, are sounded. The standard Stradella bass keyboard has as many as 120 buttons. When a musician plays the accordion, the instrument is typically held in place by shoulder-straps as the player sits or stands. The bellows are pulled apart or pressed together as keys are depressed, and air is forced through the reeds. As keys on the treble keyboard are pressed by the right hand fingers, the reeds associated with those keys vibrate and produce specific notes. The left hand, which is primarily responsible for moving the bellows, also operates the bass notes, which provide accompanying sounds and major and minor chords. While the chromatic accordions, such as the Piano accordion or the Continental chromatic accordion, are the standard instrument in the United States, other types are available. Diatonic accordions are still manufactured since they are often used in folk music. Common types include the melodeon, the continental club model, and the British chromatic. A recent invention are the electronic piano accordions. Two types are made, one which has a normal bellows and reeds, but also an electronic tone generator. Another is fully electronic, and the bellows only serves to control the instrument's volume. Literally hundreds of different parts are used to make an accordion. These can be made of a variety of materials, including wood, metal, plastic, and others. The larger parts of the instrument, such as the frame, pallets, and reed block are typically made of poplar wood. This wood is useful because it is sturdy and lightweight. The bellows are made of strong manilla cardboard which is folded and pleated. Leather gussets are put on each inner corner, and metal protectors are fashioned on the outer corners to strengthen and protect the bellows. The treble grill is a fretted metal cover. It is often decorated with the manufacturer's logo and is vented to allow greater sound production. reed. The rods which connect the bass buttons to the pallets and register slides that control the reed blocks on the inside of the accordion are also made of metal. The straps which allow the player to wear the accordion are made of strong leather and are usually padded. Leather or plastic washers are used throughout the instrument to keep it airtight. Additionally, wax is also used in some areas to prevent air leaks. Finally, the keys on the treble keyboard and the many buttons and switches are primarily made of plastic. The manufacture of an accordion is not a completely automated process. In a sense, all accordions could be called handmade, since there is always some hand assembly of the small parts required. The general process involves making the individual parts, assembling the subsections, assembling the entire instrument, and final decorating and packaging. 1 Depending on the manufacturer, the parts of an accordion can be supplied by outside manufacturers or made in-house. The wooden parts are typically cut into the appropriate shapes by jigs and presses. This is an automated process in which the wood passes by these machines and is then cut. This system significantly simplifies the repeated making of identical components and ensures they are made with a high degree of precision. 2 The plastic components of the accordion such as the buttons and keys are usually produced by injection molding. In this approach, plastic is supplied as granules or powder and is fed into a large hopper. It is then heated, converting it into a liquid that can then be forcibly injected into a mold. After it cools, it solidifies and maintains its shape after the die is opened. 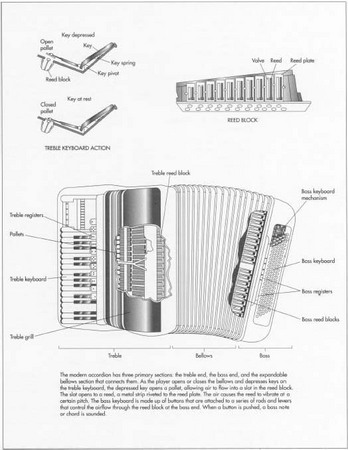 3 Various processes are used to construct the many metal parts of an accordion. These typically involve melting the metal to a liquid form, then placing it in a preformed mold. When the metal is cooled and hardened, the mold is opened and the part is complete. In the case of the reeds, the metal is specially treated by a process called tempering. This reduces the hardness and brittleness of the metal, making it more ductile and tough. 4 After the individual parts are made, partial assembly begins. The reeds are riveted, or screwed, to an aluminum alloy reed plate. This plate has two slots, and the reeds are attached over each on opposite sides. On the open end of each slot, a leather or plastic valve is secured. 5 The reed plates are then arranged in a specific order and attached to a wooden reed block. Depending on the model, three or four of these blocks are put in the treble and bass side casings. The treble keyboard is attached to the reed block, and the bass side buttons and keyboards are also attached. 6 The bellows is typically supplied by outside manufacturers. It is made by folding and pleating strong cardboard and reinforcing it with leather and steel strips. The treble and bass casings are attached to it and sealed with wax to prevent air leakage. 7 After the main parts have been assembled, various decorative finishing touches are put on the accordion. For example, the instrument is painted, the treble grill is attached, and the manufacturer's name is added. The accordion is then put in its case, packaged, and shipped to distributors for sale. Quality control begins with the incoming raw materials and parts that are used to construct an accordion. If the manufacturer makes their own plastic parts, the starting resin is checked to ensure that it measures up to specifications related to physical appearance, melting point, and molecular weight, to name a few. Wood and steel are also checked similarly. For parts that are obtained by outside suppliers, the instrument manufacturer often relies on the supplier's quality control checks. During the production process, the quality of each accordion is verified by trained line inspectors and craftspersons. They perform visual inspections at each step and detect most flaws. Improvements to the accordion have continued since its creation in the early nineteenth century. One recent invention is an accordion attachment that allows the musician to modify notes by "bending" the tone. This extra control over notes vastly improves on limitations of the current reed technology. Future instruments promise to utilize this type of technology and also to be more refined in the areas of tone and acoustic projection of sound, as well as in the areas of playability and handling. With the availability of increasingly lighter materials and the incorporation of computer technology, future accordions will certainly be much more versatile than their predecessors. Flynn, Ronald, Edwin Davison, and Edward Chavez. The Golden Age of the Accordion. Flynn Publications, 1992. Liggett, Wallace. The History of the Accordion in New Zealand. New Zealand Accordion Association, 1992. Spence, Scott. "The MIDI Polka." Electronic Musician, March 1, 1995, p.66. Wallace, Len. "The Accordion—The People Instrument" Canadian Folk Music Bulletin, Fall 1992.